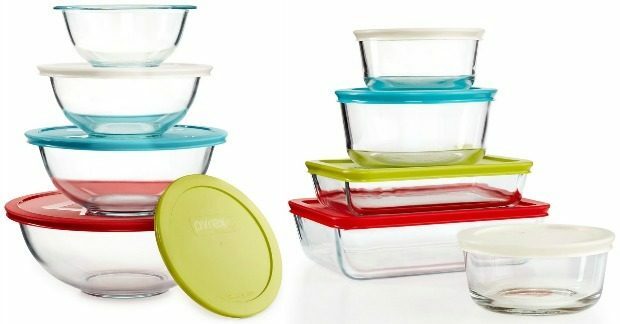 Pyrex 8pc Bowl Or 10pc Simply Store Set Just $9.99 PLUS FREE Shipping! You are here: Home / Great Deals / Pyrex 8pc Bowl Or 10pc Simply Store Set Just $9.99 PLUS FREE Shipping! TODAY ONLY you can get a Pyrex 8pc Mixing Bowl set OR a 10 piece Simply Store set! They are both on sale for $14.99 – normally $40! If you use the $5 Mail-In Rebate you can get them for just $9.99! I have a set of the mixing bowls and I LOVE them! PLUS, you can get FREE shipping, too! Perfect for virtually every kitchen task—from cooking to serving to storing—this set of four covered bowls can go from the freezer to oven and then straight to the dinner table. Made of durable, impact-resistant glass with colorful, tight-fitting lids that lock in freshness. These non-porous & ultra-durable vessels from Pyrex have freshness-sealing lids to move effortlessly from the fridge to the microwave to the table. Each container has a colored lid that makes it easy to spot, organize and stack.